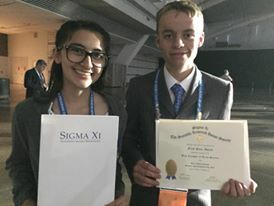 Updates, Adventures at Intel ISEF, and More! It has been a long time since I have posted a blog as I have been very busy with AP classes, SAT test, Robotics, Science Fair and much more, but I am back and will be posting regularly as my adventures in Science and Technology continue into my senior year of high school! Here is a quick update on my recent science journey! I have continued to participate in competitive robotics competitions through FIRST Robotics. I have now been to the Regional Championship five times, the West Coast Super Regional Championship one time, and the FIRST World Championship in Houston Texas two times. I have developed my engineering and programming abilities which have encouraged me to continue to pursue an Aerospace Engineering Degree after graduating from high school. Along with robotics, I have been granted the NCWIT Aspirations in Computing Award for my work with Raspberry Pi as well as Arduinos as of recently. This award allowed me to go to Charlotte, North Carolina and meet other young women who have a fascination with programming and other STEM fields. I was also able to meet programmers from numerous companies such as Bank of America who is actively working to improve cybersecurity programs and support young students in programming. NCWIT provides large amounts of opportunities for young women, such as myself, to enter careers in computing. I was given the opportunity to apply for a grant that would allow me to teach computing skills to other girls as part of a summer institute. Fortunately, I was awarded the grant and will be conducting a computing course through aerospace engineering this summer for middle and high school girls in my area. We will be learning how to program Arduinos, and utilizing these skills to program air swimmers and sensors that will be implemented into a high altitude weather balloon that we will launch at the end of the session. During all of these activities, I continued to conduct science fair projects on various topics and moved onto the county, state and as of this past week, the Intel International Science and Engineering Fair. This brings us to the subject of today’s blog post which will be regarding my partner, Tanner Packham, and my science fair project from the 2018 science fair, and the electronics utilized in this project. The International Science and Engineering Fair is a competition that has over 1700 students participating from over 81 countries worldwide. Students gathered in Pittsburgh, Pennsylvania to compete and interact with other students that have similar interests to learn about different cultures, different languages, and different impactful scientific research being conducted. During the course of this week, we were able to attend symposiums of entrepreneurs, Nobel Laureates, ISEF alumni, and more. There are also many activities available to encourage students to interact and create friendships and relationships through dancing, exchanging pins associated with your country or region, and interactions with new technology in the Intel quad. Tanner and I conducted research regarding Alzheimer’s Disease, testing methods to stimulate gamma wave production in the brain that is correlated to the decrease in beta-amyloid plaques that are responsible for many symptoms of Alzheimer’s such as memory loss and difficulties formulating sentences. We were selected from our county fair along with 2 other students to advance to the International Fair. The gamma waves in the brain being produced were measured using a modified kids game called a Mindflex that we hacked to act as an EEG utilizing the Neurosky chip inside the headset. The headset would be worn on the subjects head and the serial output data would be sent to an Arduino Uno where we developed code that filter out the data being sent from the headset to isolate the high gamma and low gamma readings as those were the only ones we were interested in. This data would be stored onto an SD card using an SD shield on the Arduino so that we could implement these text files into Microsoft Sheets to create our graphs along with the time and signal data also provided by the headset. After obtaining a three-minute baseline for each subject the stimulus was applied for another three minutes to gather data regarding the gamma wave activity in the brain. Tanner and I found that the gamma wave activity had a statistically significant increase following the application of the stimulus to the subject. Tanner and I plan to expand our research by collecting more data and hope to test our technology on patients who currently suffer from Alzheimer’s Disease. 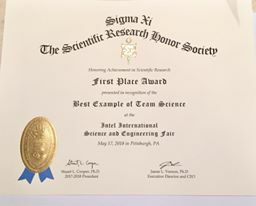 In the International Fair, Tanner and I won a special award from the Sigma Xi Society of $2000 and a membership to their society for our exemplary work and promising research. Aside from our project, I enjoyed the activities that Intel ISEF provided. My favorite activity was the pin exchange on the first day of the competition because I was able to talk to students from all over the world while exchanging pieces of our cultures. In this picture, I have pins from many different countries and states as well as a koala stuffed animal that I received from a former Broadcom MASTERS International student that I met in 2014. I also enjoyed interacting with new technology in the Intel Quad. There were many virtual reality stations and a DIY circuit board pin station, along with musical stations, photo booths, and an Arduino robot soccer arena. During the event, I diverged from the ISEF festivities to interact with the 2018 Broadcom MASTERS International students and talk about my experience as a Broadcom MASTER and how it helped me achieve the goals I have reached today. I was able to do a scavenger hunt in the Heinz History Center with another Broadcom MASTER from 2013, Cameron Jones, who was also an Intel ISEF finalist in the Physics and Astronomy category. I was able to attend an entrepreneurship symposium where I listened to many business owners who started technological companies from the ground up. I talked with Felipe Gomez del Campo, who is an aerospace engineer and the founder of FGC Plasma Solutions. I also got to attend a Nobel Laureate symposium and was able to talk to Elissa Hallem about her journey through science. Overall the International Science and Engineering Fair was an exciting and inspirational trip that has further encouraged me to pursue a STEM career. I look forward to conducting yet another science fair project next year in hopes of qualifying for Intel ISEF yet again. Over the past year or so, I’ve had an incredible experience thanks to a friend, Mike Paul Hughes. Mike was an engineer for Lockheed Martin outside of Denver, Colorado. He has recently moved to Jet Propulsion Laboratory in Pasadena, California. When I met Mike, he was working on a project called Osiris-Rex. This is a spacecraft that will be visiting an asteroid, collecting samples, and bringing them back to Earth. One time, I mentioned to Mike that it would be really cool to go tour his lab. He said that if I could make it to Colorado, he could show me around. My parents figured out a way to get us there and last October, we flew to Colorado. Next thing I knew, I was gearing up for a clean room and standing next to a spacecraft! That’s Osiris in the back, Mike Hughes on the right, and my mom and dad on either side of me. Fast forward to September, 2016. Mike invited us out to Florida to see the launch! Once before, I flew to Florida to see a space shuttle launch, but Hurricane Ernesto put an end to that. I was going to get to see a launch! At Cape Canaveral, launches happen on one side of a river and I was sitting on the other side, about as close as you can get without working for NASA. The launch was beautiful! It was much brighter than I had expected. The picture below doesn’t do it justice. While I was at Kennedy Space Center, look who I met. In the year 2023, Osiris-Rex will return with the samples and parachute down safely in the Utah desert. So far the mission is going perfectly and I hope that it stays that way until the end. Many thanks to Mike Paul Hughes, pictured below, for making all of this happen. I hope to work for you some day after I complete my degrees. Mike has a great story about persistence and grit if you ever get to see him speak on a local college campus. I’d very highly recommend it. He’s also a very talented musician. Is there anything he cannot do? One of these days, I’m going to do something on the Raspberry Pi that is going to work the first time. Today . . . is not that day. Liz and Eben Upton sent me a Raspberry Pi B+ and I was dying to see what’s new on it. I had some struggles getting NOOBS to work on it, so I downloaded a new version and it worked fine. I installed the new version of Raspbian and a few things that I noticed that were new are: 1) It has the GPIO version of Scratch already installed 2) It doesn’t have the Midori browser anymore and 3) There’s a new program called Sonic Pi installed. I played around with Sonic Pi for a while and went through the first few simple tutorials. It was fun. Then, I wanted to save my song to use in this blog. If you click “Save,” it saves your code and not your song. Then there’s a button that says “Record” that will save the song itself as a wav file . . . or so you’d think. I couldn’t find any instructions for the record button in the tutorials or even online with a simple google search. So, I just tried it. I pressed record and then played the song. When I clicked record again to stop the recording, it asked me to name the file and I chose to put in on the desktop. Simple, right? Then I went to the desktop and the file wasn’t there. I had to do some research to figure out how to find a file in Linux. I couldn’t get the “find” feature in the terminal to find the file (or maybe it turns out that it wasn’t there), so I installed a program called “mLocate” that works a little better. It turned out that the file just wasn’t there. I tried to save it with a different name, save it in a different folder, and repeated over and over and it just wouldn’t save the file. In researching how to fix this, I found out that there is a new version of Sonic Pi available and I hoped that this would fix all of my problems. Once I installed Sonic Pi version 2, the program seemed pretty much the same, so I wrote a quick song and tried to record it. The process was the same and this time, it seemed to work. But when I used mLocate to find the file, it didn’t find anything. This time, though, it was my mistake. Before you use mLocate, you have to update its database where it searches the Raspberry Pi for files and makes a list. So, when I type “sudo updatedb”, this updates mLocate’s list and then it found the file. Now, you just type “locate word” and it will find files, folders, and programs that contain the letters “word” in them. It seems as though if I type “locate word” it only looks at the present folder, but if I type “sudo locate word,” it checks the entire computer. But, the wav file wouldn’t play. It was using Jack Audio to play the file and it crashed every time I tried. Then, I found out that Alsa can be used to play wav files. My file was named practice.wav so I typed “sudo aplay practice.wav” and now it plays fine. If yours doesn’t play, it might be because you have the Pi set to play from HDMI and you have headphones plugged in or vice versa. That’s as far as I got with Sonic Pi because it took a while for reinstalling, restarting, and researching. Overall, it was fun and I will definitely use it again. We’ve also had several guest speakers who are experts in computer programming come to our school and speak. For example, we had a Google intern, we went and visited Google, and we had a programmer from JennaSys Engineering speak to us. We asked each one what programming language they would recommend that we start with. The Google Intern said “Python or Java,” the Google engineer said “Anything but Python, it’s too far from the hardware,” and the JennaSys engineer said, “Python.” So, we decided that our lessons would focus on Python. Below is the script that I wrote for our most recent lesson. 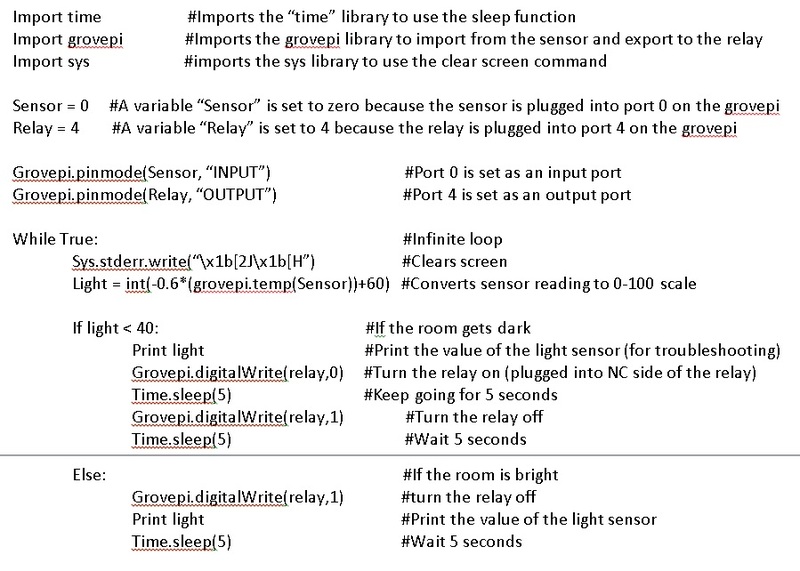 For this lesson, we used a GrovePi to take input from a light sensor and send output to a relay. The circuit spins a motor if the light level gets too low. So, this could be used to open and close your window blinds as the sun rises and sets, but that’s not very realistic. In reality, there are many, many devices that use this exact same structure. For example, your thermostat turns on the heater if the temperature gets too low and the AC if the temperature gets too high. Some cars turn on the headlights when it gets too dark. Your refrigerator compressor kicks in if the fridge gets too warm. Some cars have windshield wipers that turn on when they detect moisture. Grocery store doors open when they detect a person nearby. An alarm goes off when a door is opened. What these systems all have in common is that there is a sensor that triggers a relay to do something. There are hundreds of other examples of this, too (3D printer micro switch, printer jam detection, phone overheat protection, laptop turns off when the lid closes, etc.) so we decided to look at an example of code that can make this happen. So, although the circuit that we had that day was only slightly cool, the applications to other areas are powerful. This project also demonstrates why a Google engineer told us that Python isn’t the best language to learn. The libraries make it so easy. If you were writing code for a car’s computer, you wouldn’t be able to take the shortcut by importing the GrovePi library. Here we go again . . . another story of following the instructions for a project exactly and failing miserably. A while back, I got a GrovePi and a bunch of sensors. It would be perfect for adding inputs to the Raspberry Pi since it has temperature, pressure, flame, light, sound, knock, distance, and more sensors. So, first, I decided to try the joystick. I went to the website for GrovePi and found instructions there (dexterindustries.com or seedstudio.com). Wait . . . what? The kit didn’t come with any cables. Huh? The one in the picture has a white plastic connector with four pins. Mine has no connector and 5 pins! What’s going on here? I don’t mean to make fun of anyone and their English ability, but these sentences are so confusing that I cannot figure any of them out. And it’s only written for Arduino (yuck! ), not Raspberry Pi. The reason for all of this is that I purchased a kit on Amazon called the SunFounder 37 modules Raspberry Pi Sensor Kit. This kit is no longer available, but there are still Arduino kits like this one. You can still get the old kit at Amazon.de, but I wouldn’t recommend it. I’ll blog later about how I used the code for the analog temperature sensor to make the SunFounder analog sensor work and then modified that code to make the Photo Resistor Sensor work with very few changes. I’ve added some error handling that people on a forum told me about, so the program doesn’t crash anymore. My ultimate goal is that some of the students at my school are planting an experimental citrus grove and we want to use moisture sensors to automatically trigger an irrigation system. So, it would have about 40 moisture sensors and a couple of relays to trigger water pumps connected to a tank of reclaimed water. We might also get a water flow meter to measure how much water we’ve used and track whether the system is working. I was nominated for Broadcom MASTERS again this year. If you haven’t been following for long, it’s like the International Science Fair but for middle school students. Tomorrow is they day that they announce the Semi-Finalists! I can’t wait!!!! The announcement is at noon eastern, so I think that’s 9 am California time. Wish me luck (wait, I believe that people create their own luck by working hard). Wish me hard work, I guess.